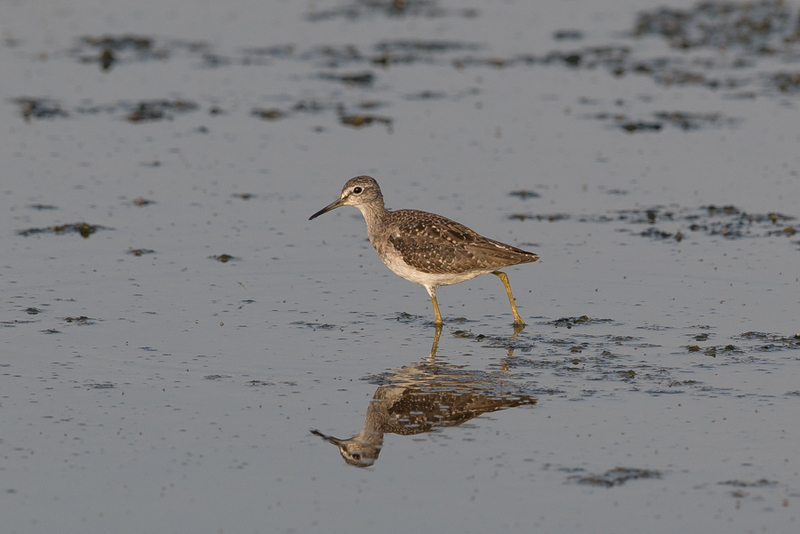 There was a good passage of Waders at the start of November with the largest number of Marsh Sandpiper I have recorded on a single day with well over 30 birds seen. 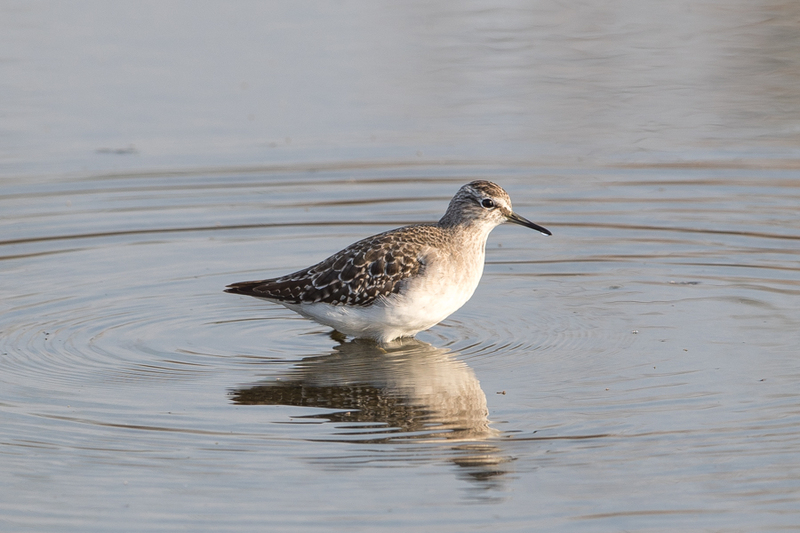 Good numbers of the uncommon Temmincks Stint were recorded with a maximum of four seen on any one day. 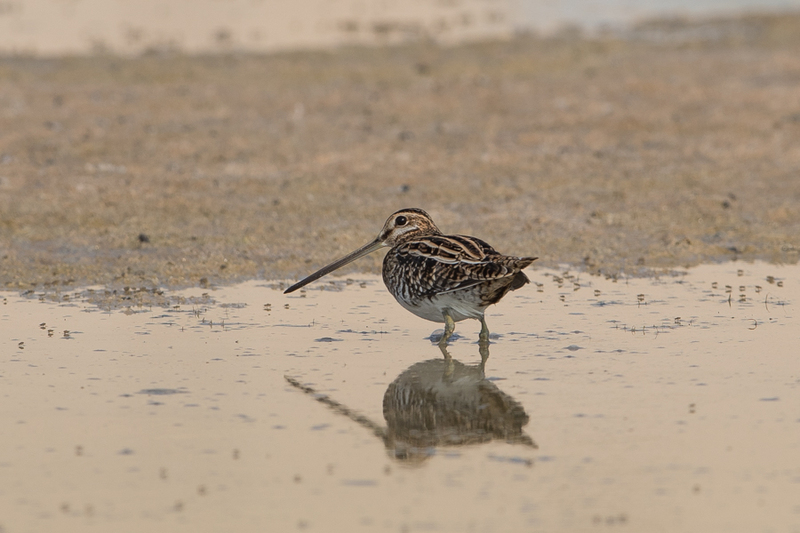 Most waders were either Dunlin or Little Stint but a few Wood Sandpiper and Common Snipe were also recorded. 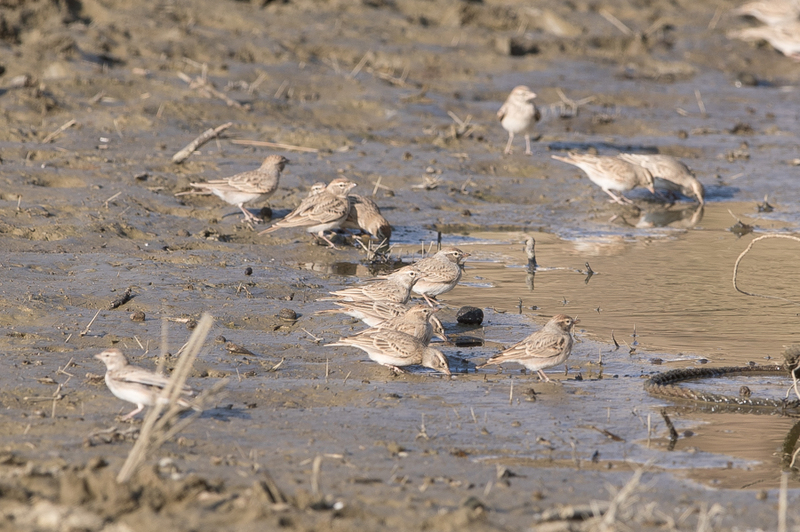 Normally Black-winged Stlts occur in large numbers but this winter numbers are significantly down on previous years. 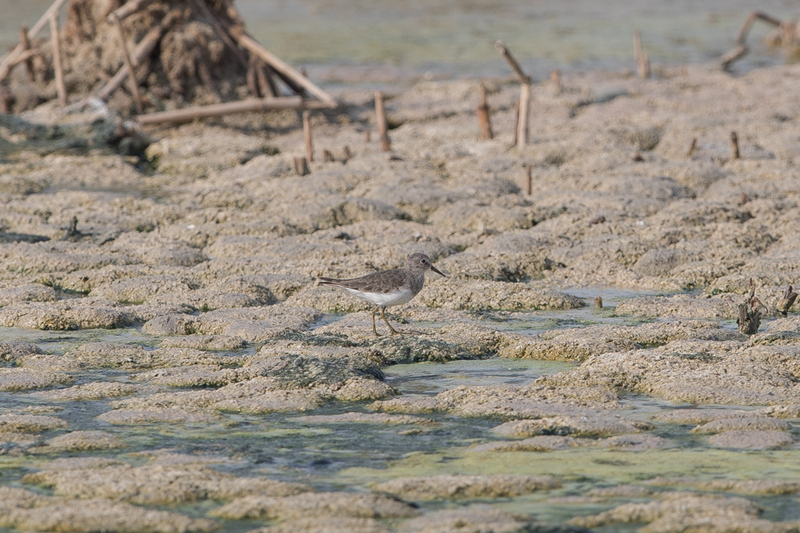 Whilst at Jubail in November I located a Northern Pintail and managed to take a few photographs. 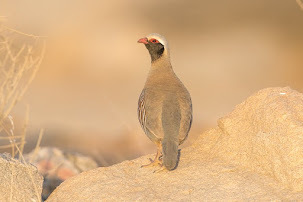 This is not an easy bird to photograph in the Kingdom, as they are shy and nervous. 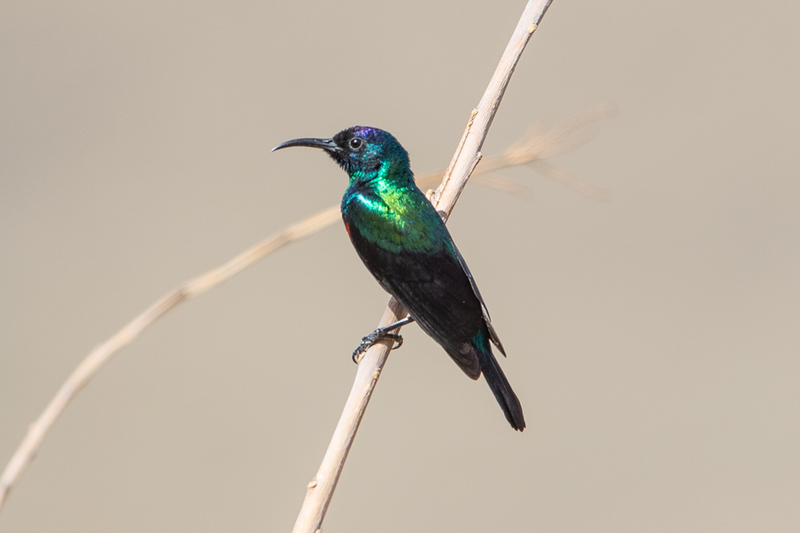 The species is an uncommon passage migrant and winter visitor to the Eastern Province of the Kingdom. 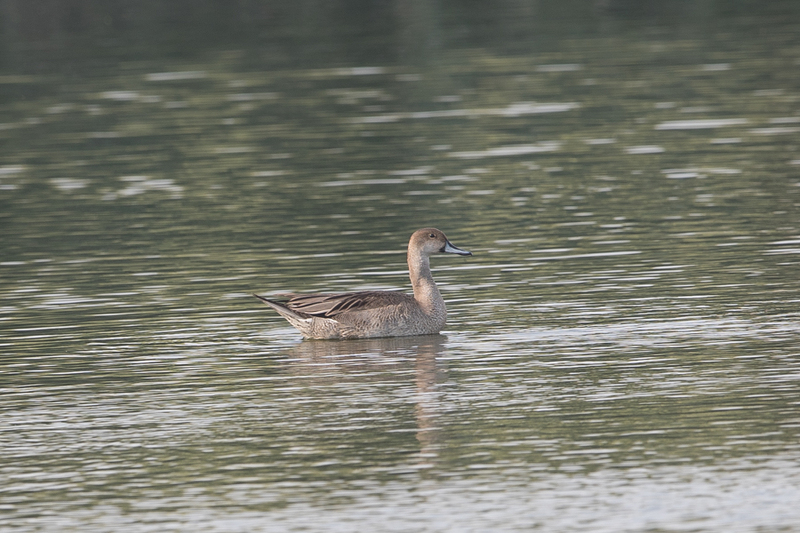 As their name implies, Northern Pintails breed throughout the northern reaches of Eurasia and North America. 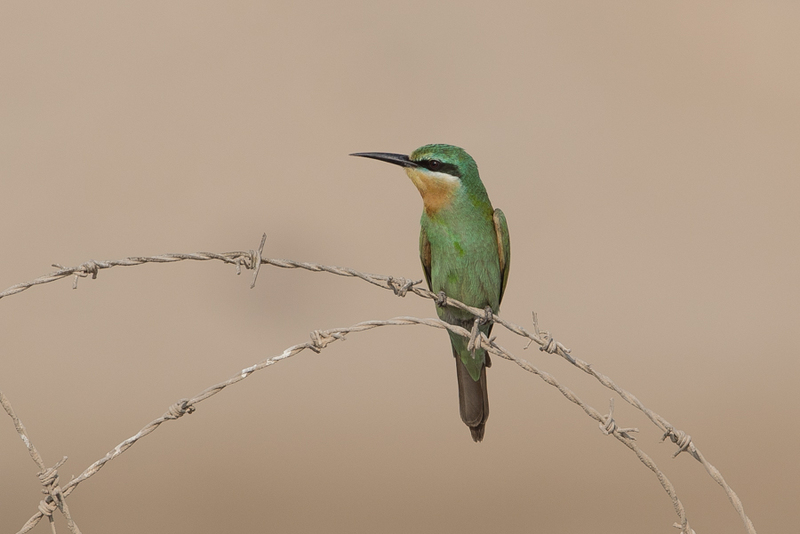 They migrate south, with some wintering in Dhahran or passing through on their way to Africa. 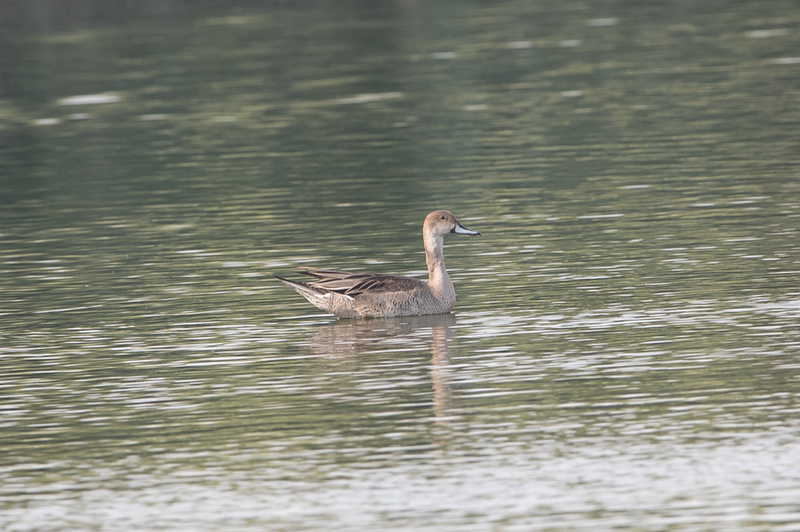 The name Pintail comes from the tails of males in breeding plumage as these birds have elongated central tail feathers that extend up to ten centimetres beyond the rest of their tail giving them a pintail appearance. 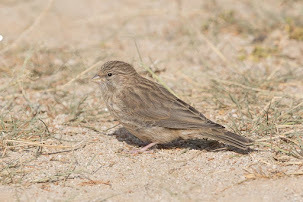 After breeding, it moults into a flecked grey-brown plumage, and appears similar to the female. 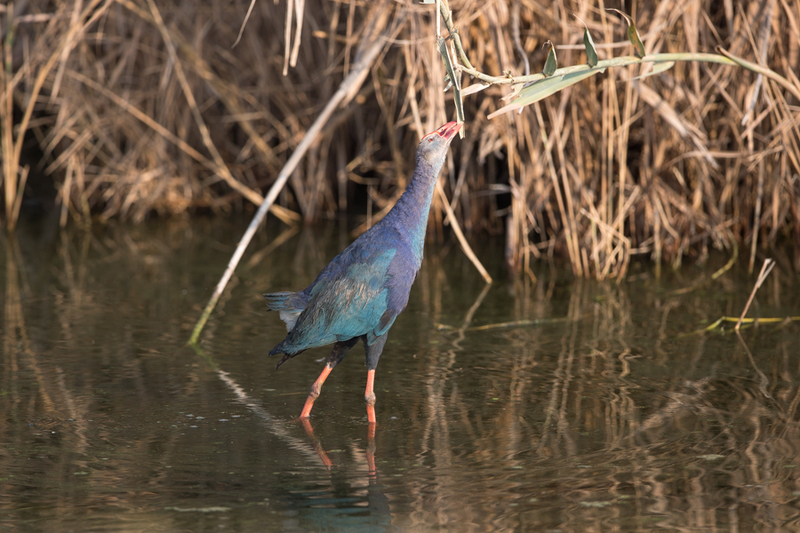 Whilst biring the Jubail area recently I have had the largest numbers of Grey-headed Swamphen that I have ever seen with over 125 birds seen in a single visit. 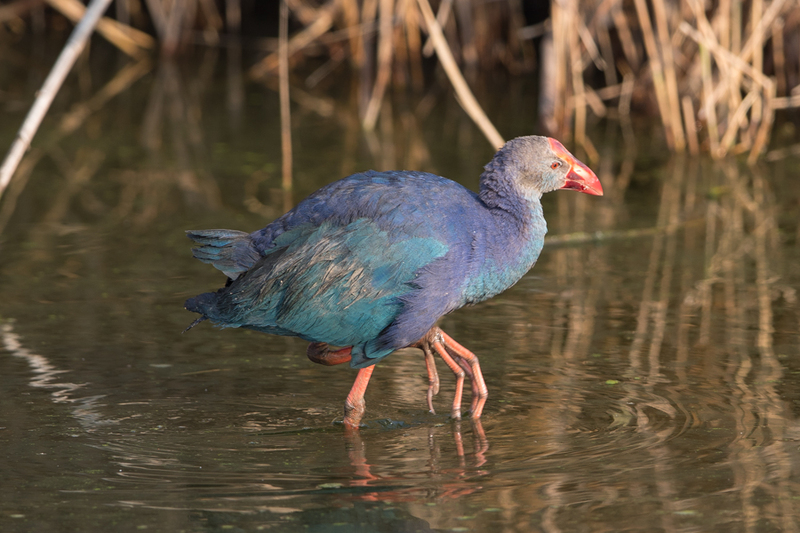 The Grey-headed Swamphen is a common resident breeder at Sabkhat Al Fasl, Jubail and has recently (August 2011) expanded its breeding range to Khafrah Marsh a wetland site 30 kilometres south-west of Sabkhat where six adults and a young bird were found. 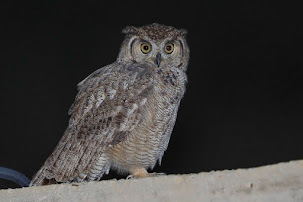 Birds have also been seen in Ash Shargiyah, Lake Al Asfar in Al Hassa and Dammam indicating they are extending their range in the Eastern Province. 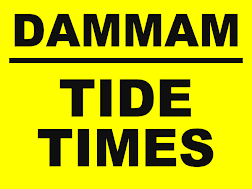 The species favoured habitat is large Phragmites australis reed-beds with associated water which is available at all the sites the species has been seen at in Saudi Arabia. 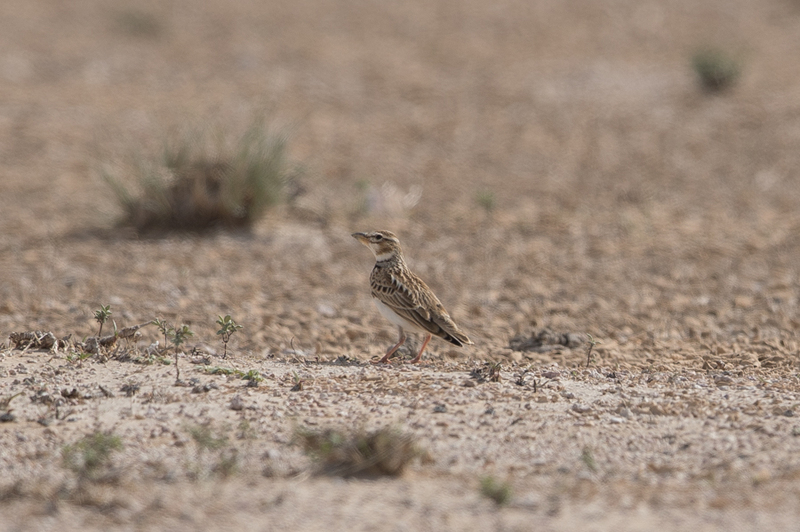 The range expansion appears to be quite quick as the first record for Saudi Arabia was on 8th August 2003 at Sabkhat Al Fasl core area 2 with breeding confirmed in 2007 and numbers increasing each year since this date. 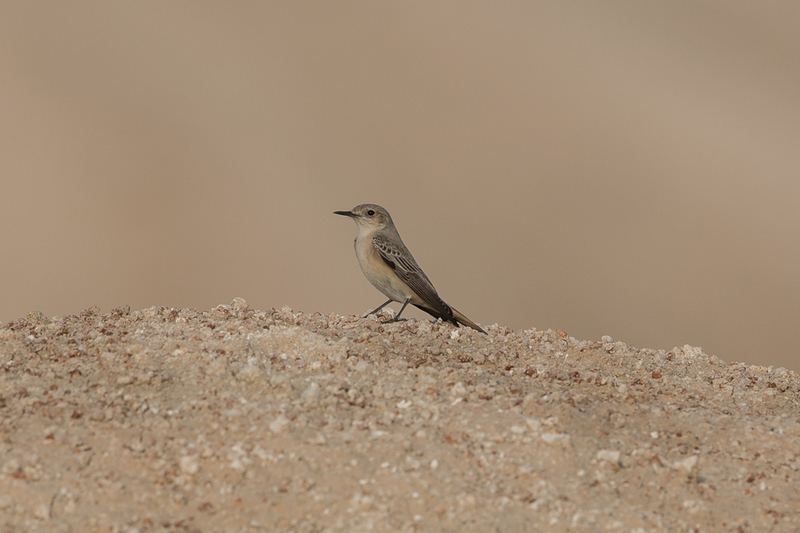 It appears that the rapid population increase observed at Sabkhat al Fasl over the past five years has created pressures on territories and prompted some birds to move to alternative suitable habitats within the Eastern Province and thereby expand its range. 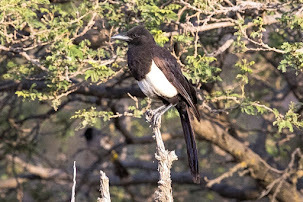 Whilst in the southwest on the Kingdom this summer I had a good number of sightings of Asir (Arabian) Magpie at two different locations. 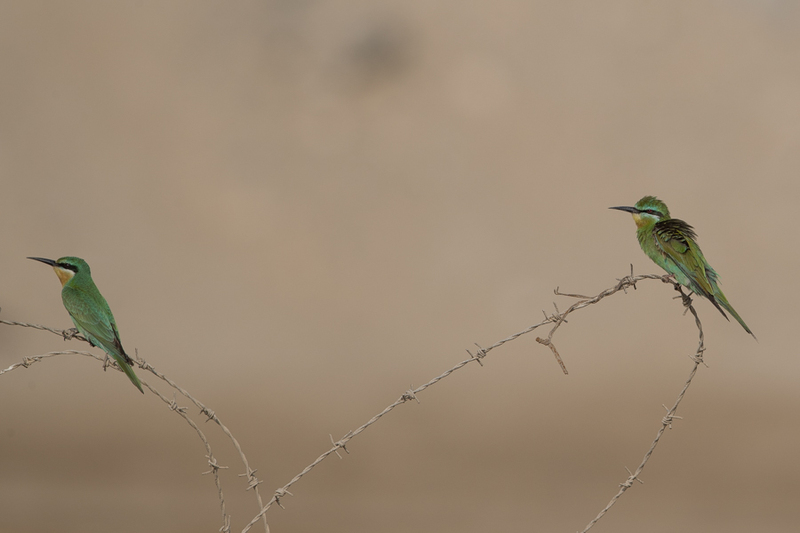 I saw a pair of birds at Tanoumah very early morning one day and followed them for a few kilometres hoping to get good photos. This species is not so easy to get close to but luckily ton this occasion I did manage to obtain a few very good photos. 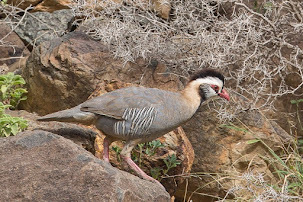 The species is now widely regarded a full species and is Saudi Arabias only true endemic as it is not found anywhere outside the Kingdom. 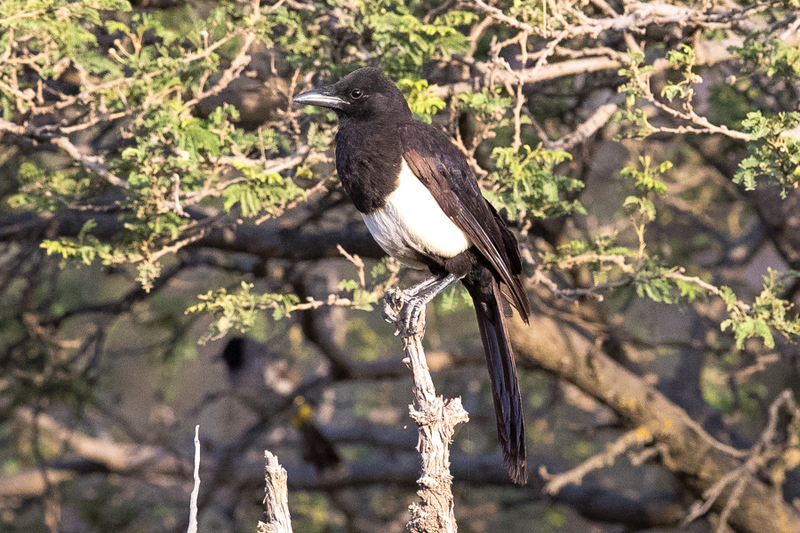 Arabian Magpies are sedentary and localised and occur in upland valleys and wadis, of the Asir highlands between 1850–3000 m asl. 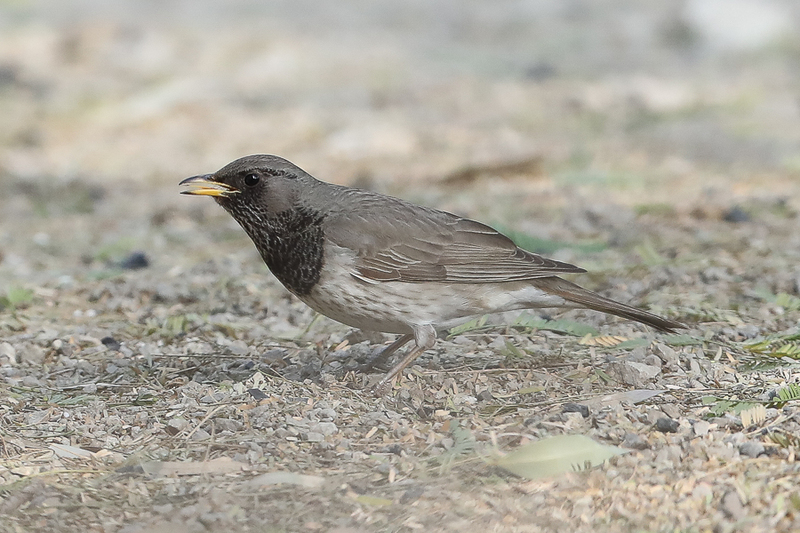 P. asirensisisis a taxon with a very restricted range, confined to a small region within Saudi Arabia where numbers are decreasing probably because of heavy disturbance by tourism and perhaps changes in climate. 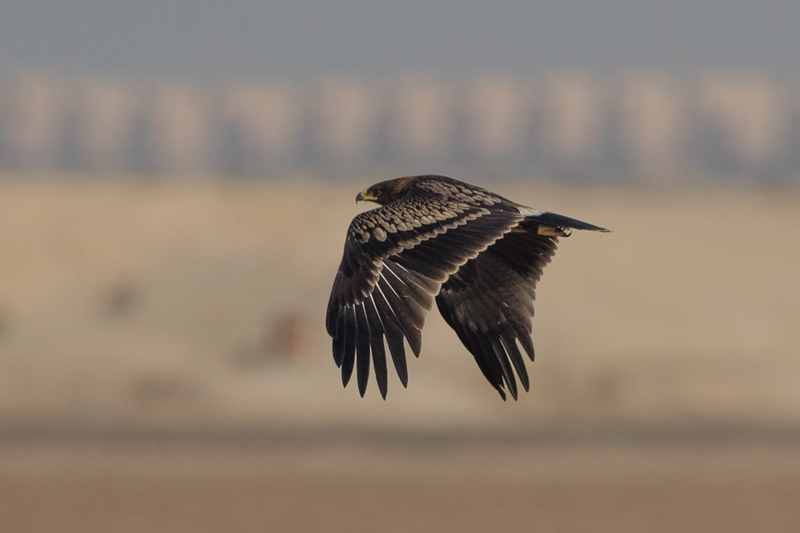 I have seen at least fifteen Greater Spotted Eagles Clanga clanga this winter in the Jubail area. 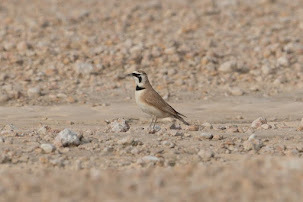 Birds winter at a number of sites in Saudi Arabia with the Jubail area the best for the species in the Eastern province. 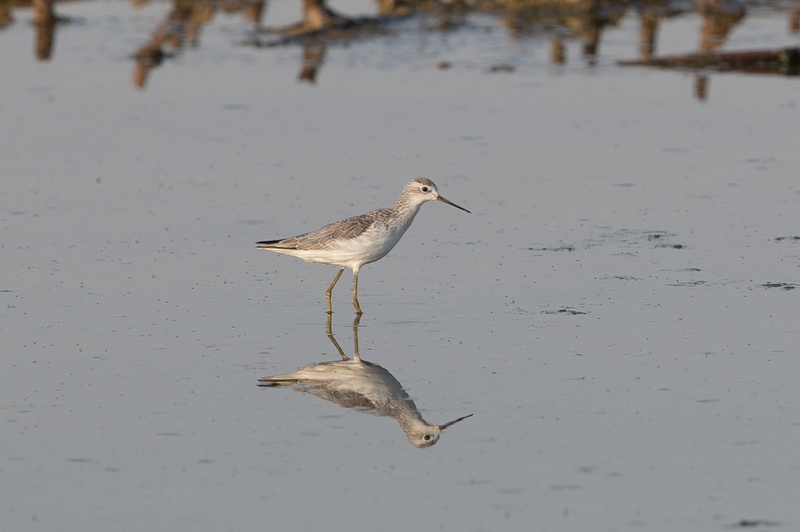 In winter birds are almost always near wetland areas with large areas where they can hunt undisturbed. 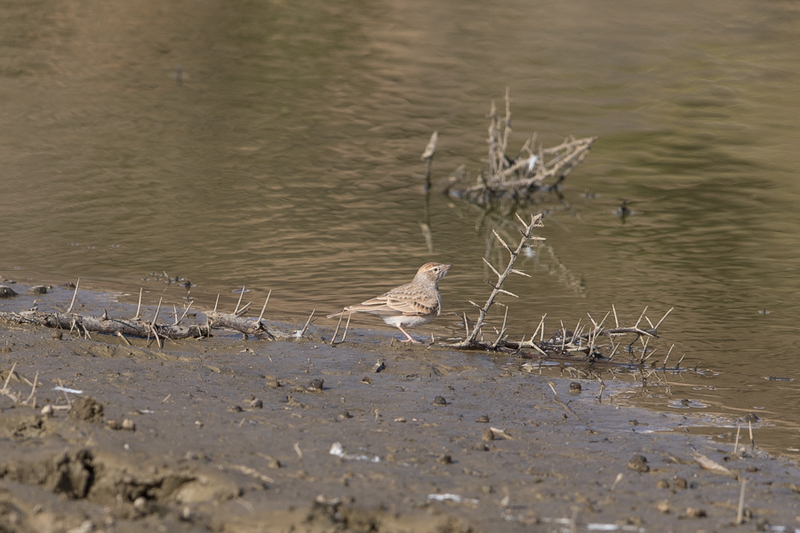 Another good site is the large wetland area of Al Asfar Lake near Al Hassa. They occupy a fragmented range, breeding mainly in Estonia, Poland, Belarus, Moldova, Russia, Ukraine, Kazakhstan, mainland China and Mongolia. 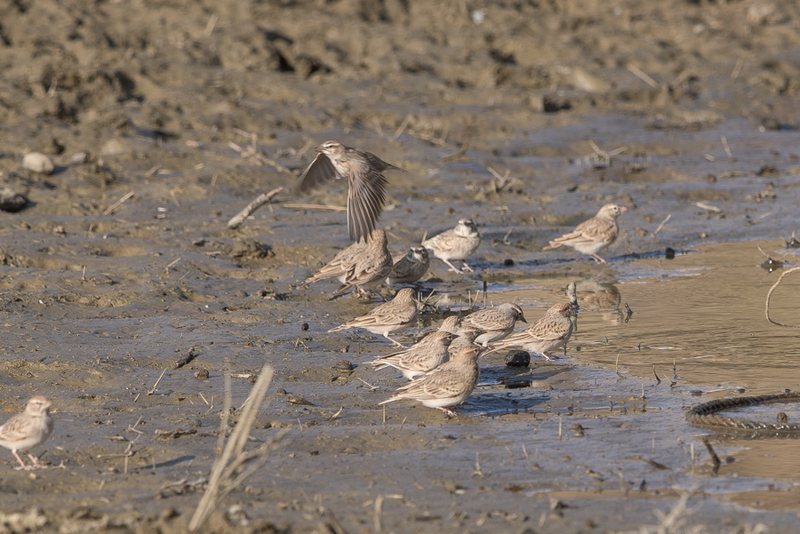 Passage or wintering birds occur in small numbers over a vast area, including central and eastern Europe, North Africa, East Africa, the Middle East, the Arabian peninsula, the Indian Subcontinent, south Asia and South-East Asia. 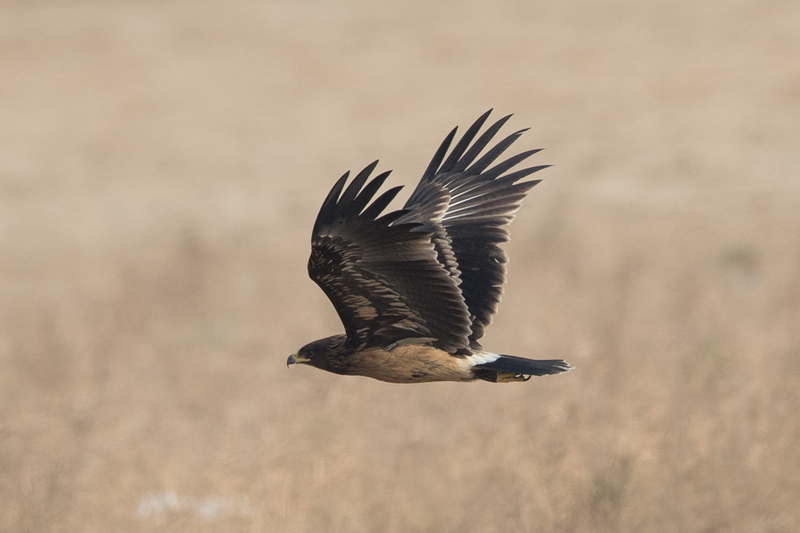 The Greater Spotted Eagle is suspected to have undergone at least a moderately rapid decline over the last three generations as a result of habitat loss and degradation throughout its breeding and wintering ranges, together with the effects of disturbance, persecution and competition with other predators. The species is listed on the Red Data list as Vulnerable as the species is facing a high risk of extinction in the wild in the medium-term future. 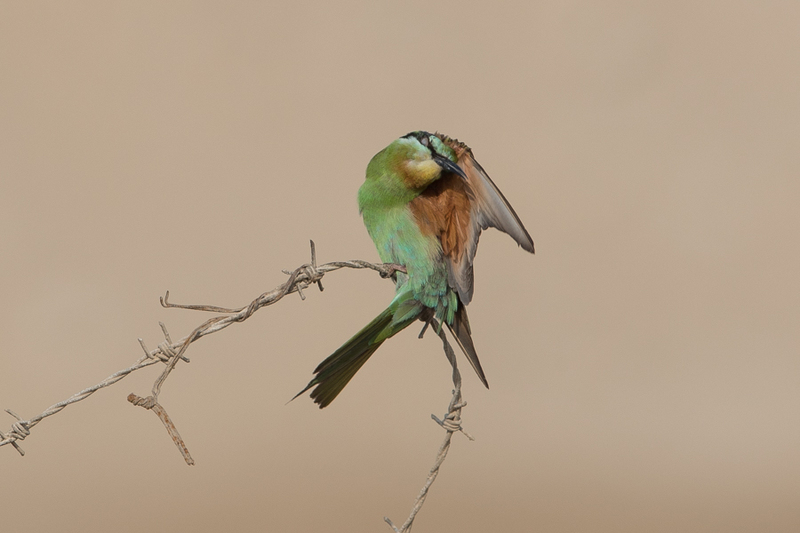 This autumn there have been large numbers of Blue-cheeked Bee-eaters passing over Jubail as well as many other areas of the Eastern Province. 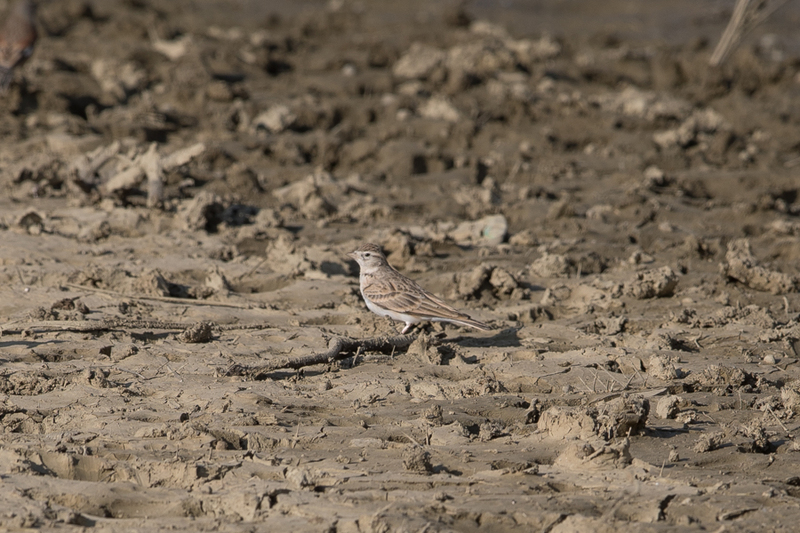 The species is a common passage migrant through the Eastern Province of Saudi Arabia with good numbers of birds passing in the spring as well as the autumn. 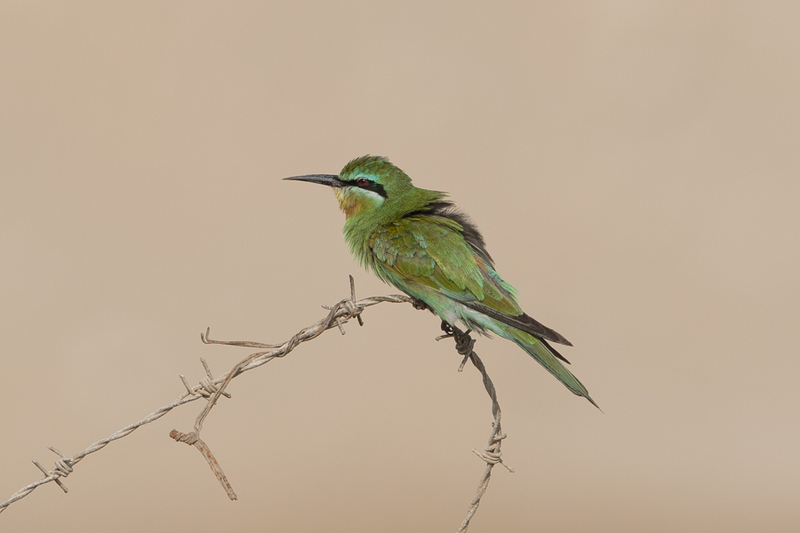 Numbers are commoner in the autumn when they outnumber European Bee-eater whereas the opposite is true in the spring. 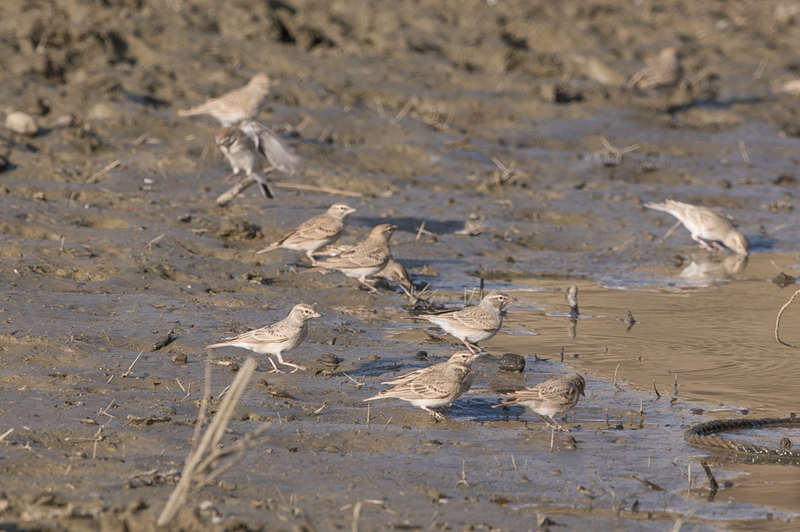 This year birds have been seen eating insects on the ground with a favourite insect the Migratory Locust. 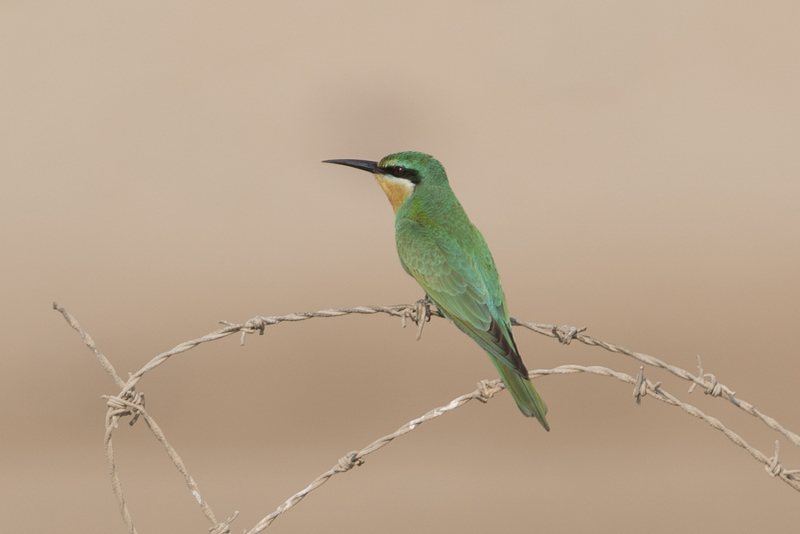 Blue-cheeked Bee-eater pass later in November than European Bee-eaters but both are common in the peak migration seasons. I have visited the southwest highlands many times this year and have managed to take a few reasonable photos of Yemen Warbler a species that is not so easy to photograph. 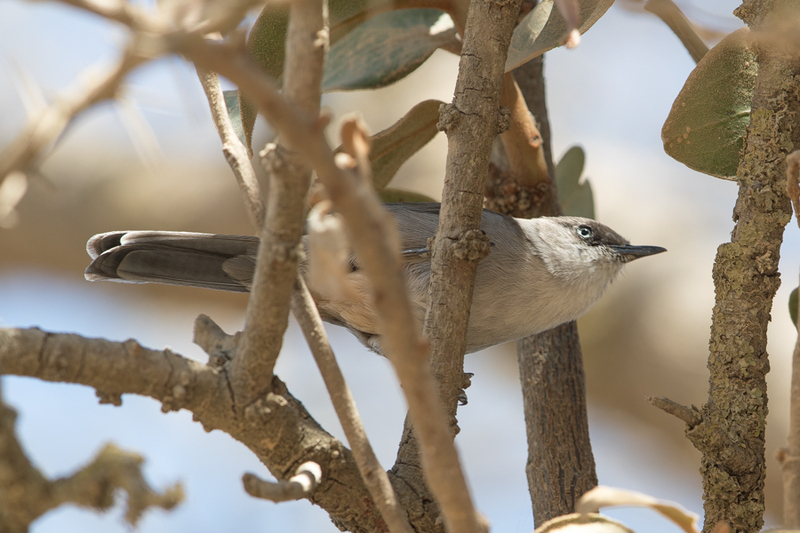 Yemen Warbler Sylvia buryi is a common, but local, resident of the south-west highlands in bushy areas especially on the Raydah escarpment, and slightly less frequently in similar habitats on the Jebal Souda plateau and areas around Tanoumah and Al Baha as far north as Wadi Thee Gazelle near Taif. In 1987 it was recorded more frequently than in 2010, especially on the plateau area. It is native to south-west Saudi Arabia and west Yemen and is a rather plain-looking warbler with a large head, short wings and a long tail. Both sexes are sooty-grey to dark brown above, with a darker head, especially around the eye and a distinctively white iris, contrasting with the dark orbital ring. 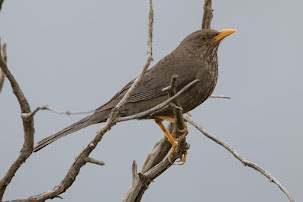 The dark upperparts are clearly demarcated from the pale underparts, which are white on the throat and buffish on the belly, with a dull apricot patch between the legs. 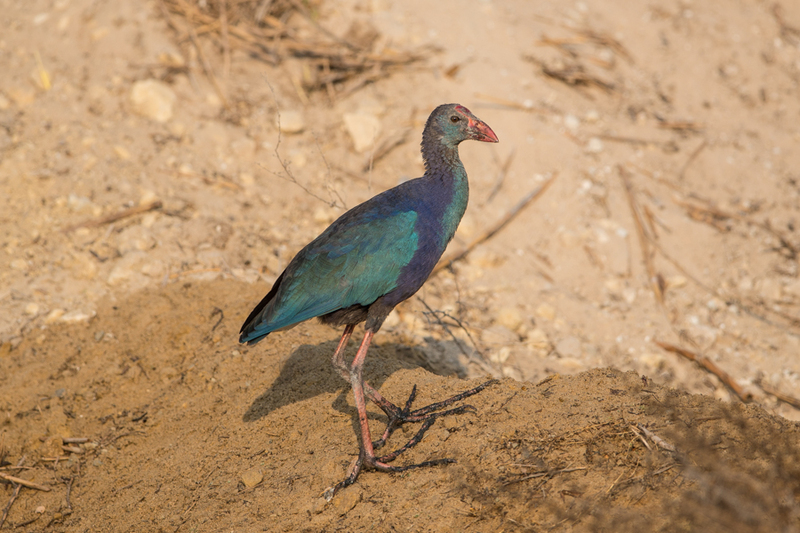 It is classified as vulnerable (VU) on the IUCN Red List 2006 and has a population of less than 10,000 mature birds. 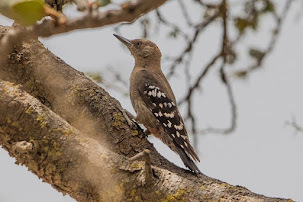 They have a slow song that is quite loud as well as a thrush like warble and are very active, almost always in pairs where they search for insects in the centre of thick acacias, frequently hanging upside down. 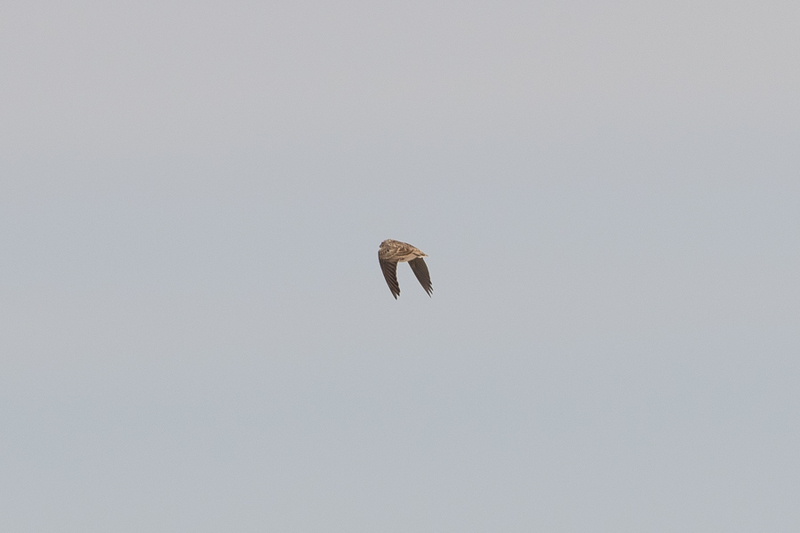 Their flight is weak and low, with an upwards swoop when landing on a branch. In Saudi Arabia, this species is found mostly within well-developed Juniperus woodland between 1500 & 2900 metres above sea level. They nest in bushes or trees, normally at a low height and breed from March to July. Their diet consists primarily of insects, but fruits will also be taken when available. 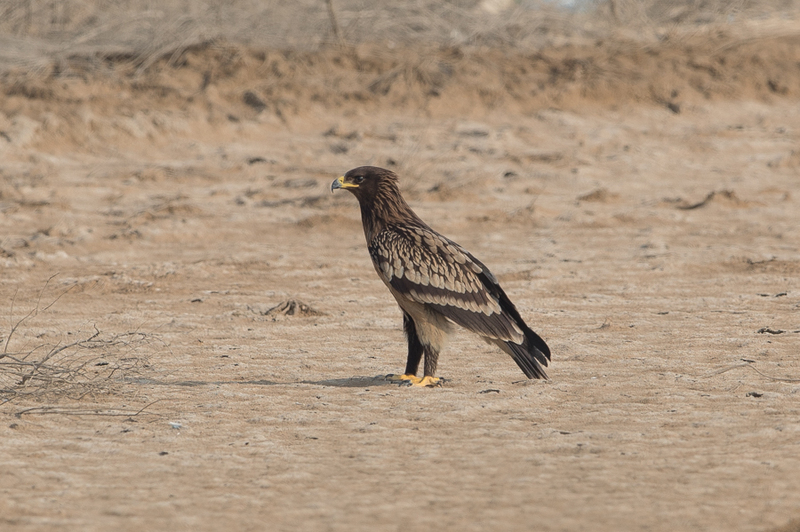 Paul Wells sent me an email and photograph of one of two Crested Honey Buzzards he saw in Dharan on 14 December. 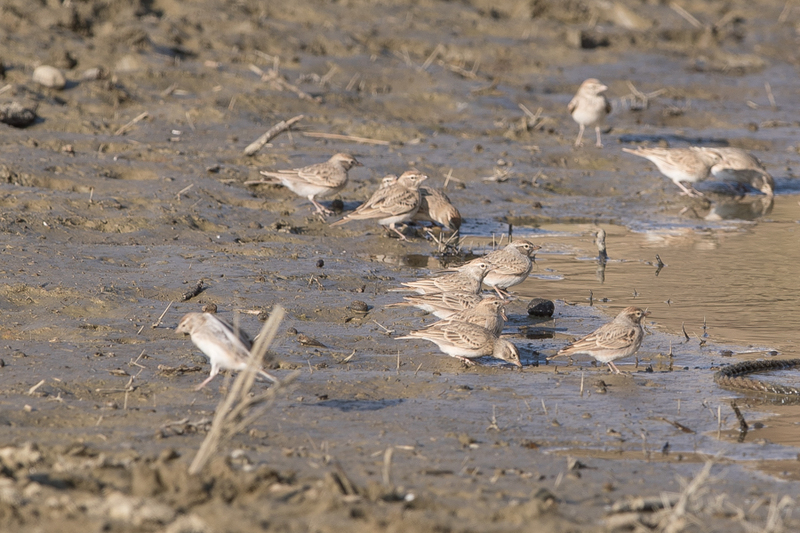 These birds and a third individual have been around since mid-September in Dhahran a location where they have spent the last five years at least wintering. It is not certain if the birds now stay all summer as well. 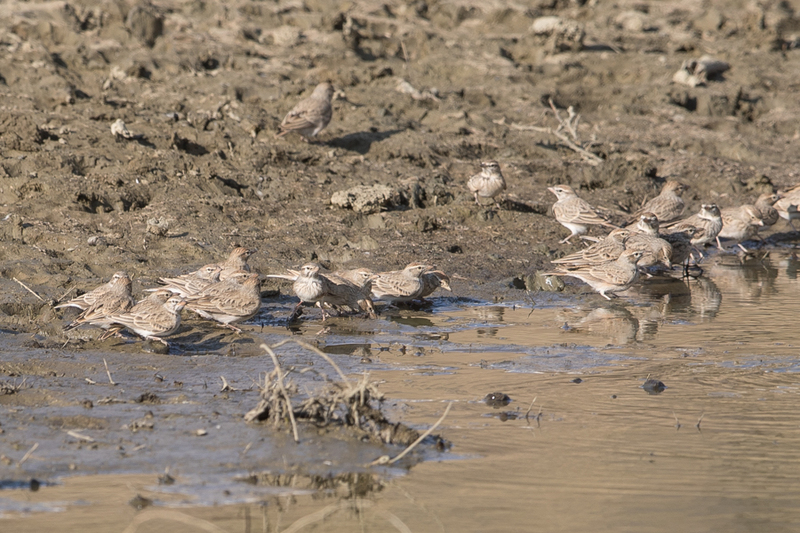 They appear to go from May to August so currently I have them as a wintering species in the area. 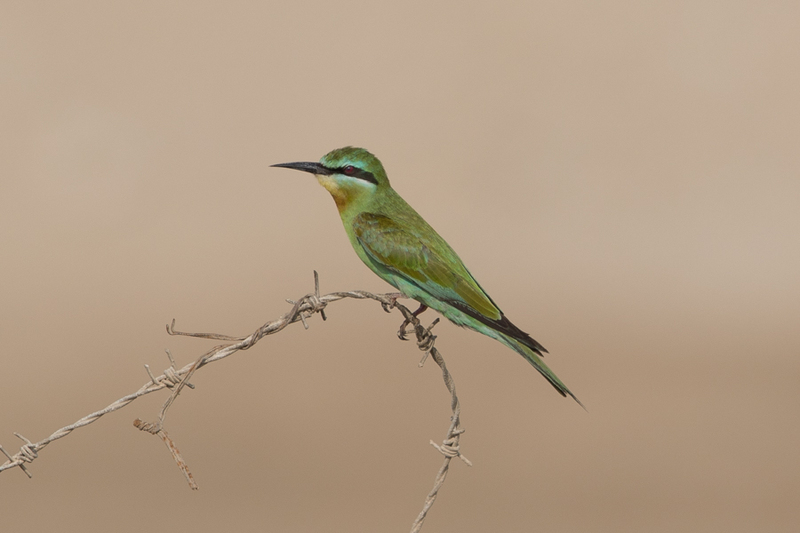 I have seen birds in Dhahran twice in mid-summer no conclusive evidence they remain throughout that period. 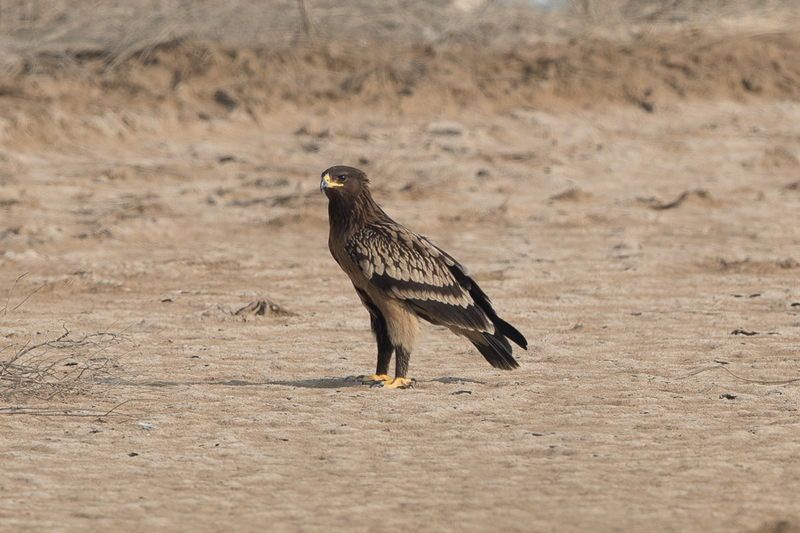 The current status, of Crested Honey Buzzard in Saudi Arabia is a scarce passage migrant and winter visitor that also occurs rarely in summer. Most records are from the Eastern province in winter and spring with additional records in the west of the country in autumn, winter and spring. 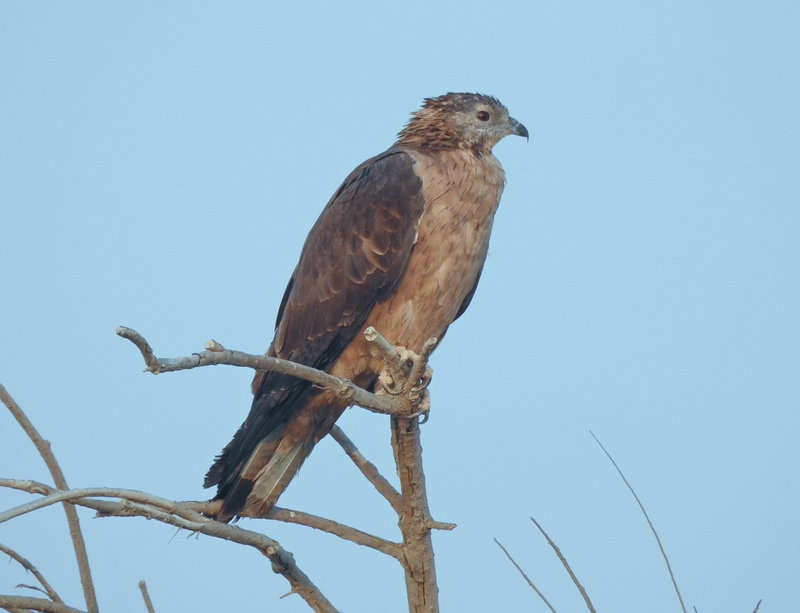 The bird appears to be a young female Crested Honey Buzzard. 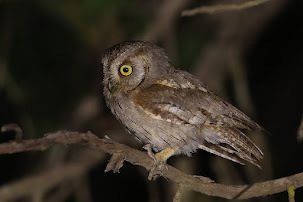 Whilst in Tanoumah in October Phil Roberts and I set up Phil’s trail camera and left it overnight to see if we could photograph anything interesting. 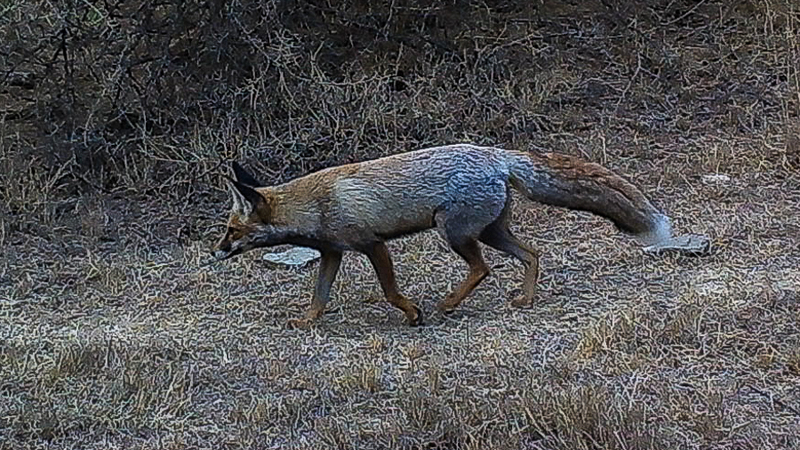 We were hoping for Indian Porcupine or something rare but only managed a couple of Arabian Red Foxes Vulpes vulpes. 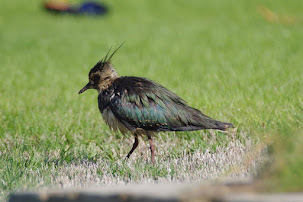 One was taken in the daylight and shows and animal with its winter coat, as the temperature was only 22 degrees Celsius much cooler tha the 34 degrees Celsius we left behind in Dhahran where we live. I have not seen Arabian Red Fox in the southwest although we did get photos on a camera trap left overnight near Abha this spring. The Red Fox is currently regarded as a single species and has the widest natural distribution of any terrestrial carnivore, possibly any terrestrial mammal in the world. 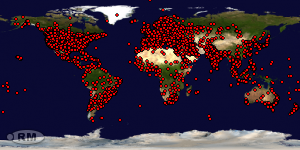 Its range spans approximately 70 million square kilometres encompassing much of Europe, Asia and North America and extending into North Africa, with an introduced population in Australia. The Red Fox occupies a wide variety of ecosystems, including forests, grasslands, deserts and agricultural and human-dominated environments. They are certainly very different to the Red Fox we get in the United Kingdom of which I am familiar, being much smaller and a very different colour. They also have much bigger ears and more fur between their toes, all things adapted for living in the hot desert conditions. 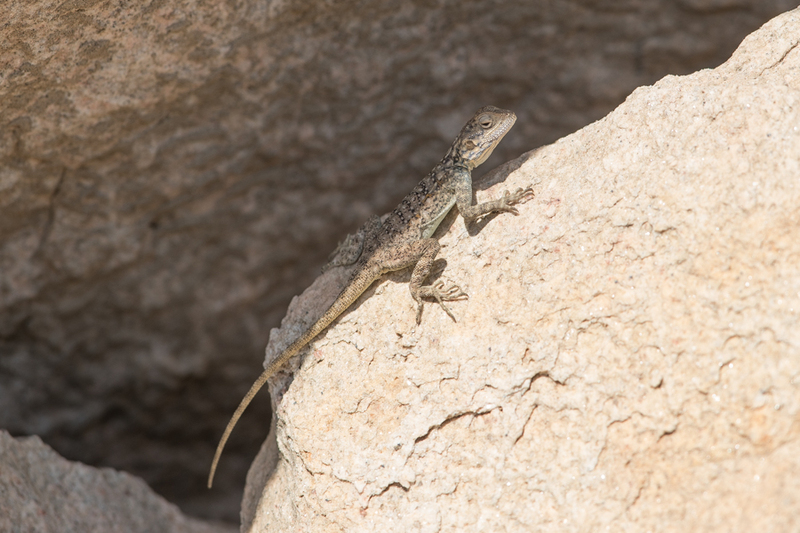 Whilst in Tanoumah I found a lizard that looks like Pale Agama Trapelus pallidus hassi on a large roadside boulder and another on a dry-stone wall in the Tanoumah area. The species is normally found in rocky areas and open plains, preferring vegetation areas. 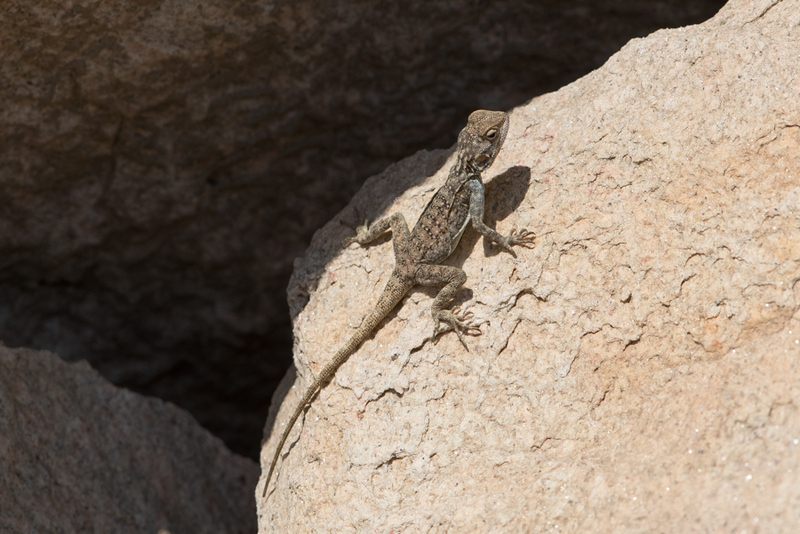 This lizard has a medium-sized body up to 15 cm in length, with a tail up to 30 cm. 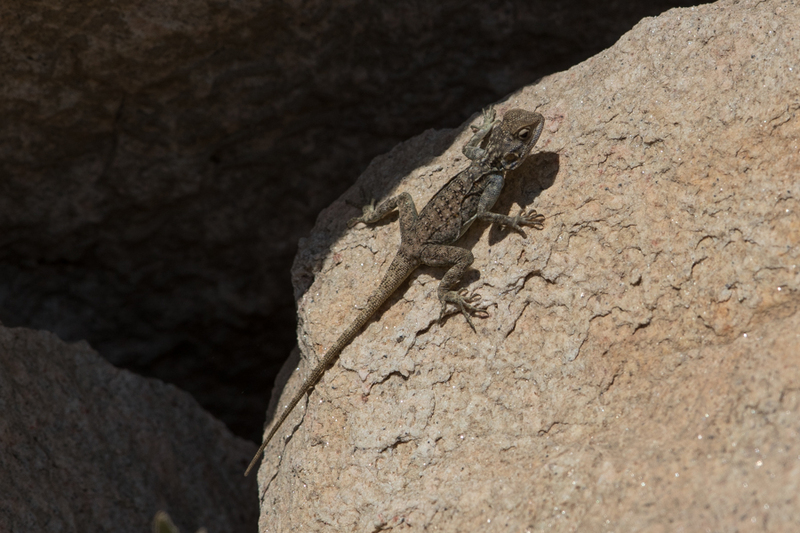 The general body color is light gray, characterized with rhomboidal strikes on the back with dark rings on the tail. The head isrelatively large and triangle shaped. The limbs end with long sharp clawed fingers. Dorsal color sandy gray, back usually with 4 brown transverse bands; the band at mid-body is weakly defined or absent. Tail barred. 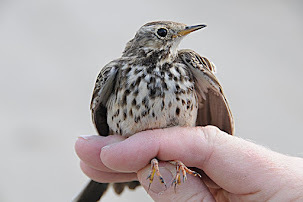 Venter white; throat usually plain, sometimes with faint marks. Dorsal pattern becomes rather inconspicuous in adult males. In nuptial condition, the whole head becomes pale lead-gray in males, while in females it is suffused pale orange-red. Juveniles are sandy gray with a strong dorsal pattern. 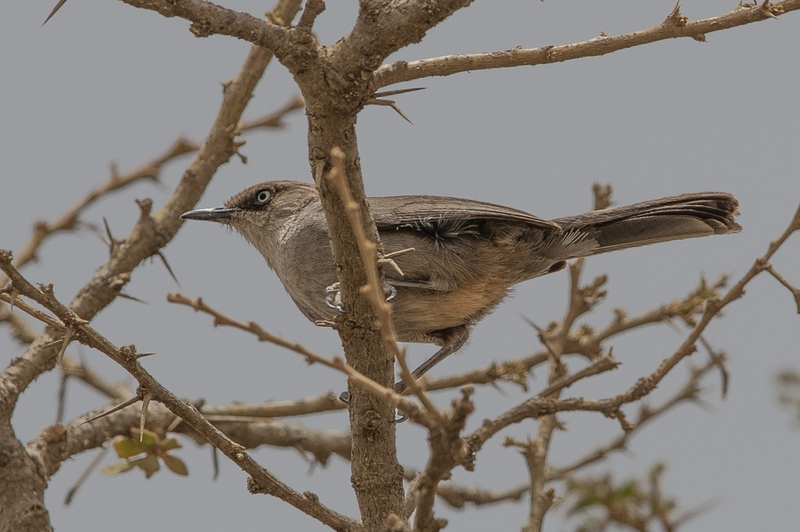 Whilst in Tanoumah the last few visits I have seen Yemen Warbler Sylvia buryi each time. 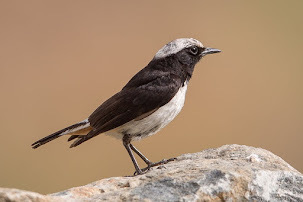 The species is a common resident of the south-west highlands in bushy areas especially the area around Tanoumah and Al Baha as far north as Wadi Thee Gazelle near Taif. The species is local in its occurrence. In 1987 it was recorded more frequently than in 2010, especially on the plateau area. 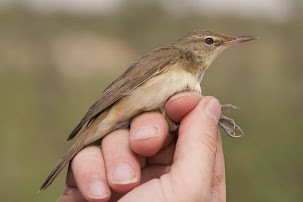 It is native to south-west Saudi Arabia and west Yemen and is a rather plain-looking warbler with a large head, short wings and a long tail. Both sexes are sooty-grey to dark brown above, with a darker head, especially around the eye and a distinctively white iris, contrasting with the dark orbital ring. 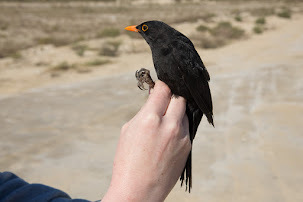 The dark upperparts are clearly demarcated from the pale underparts, which are white on the throat and buffish on the belly, with a dull apricot patch between the legs. 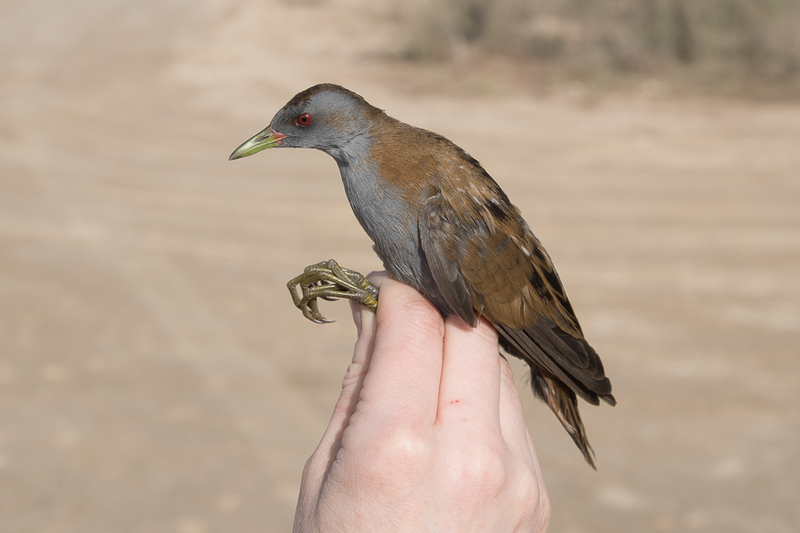 It is classified as vulnerable (VU) on the IUCN Red List 2006 and has a population of less than 10,000 mature birds. 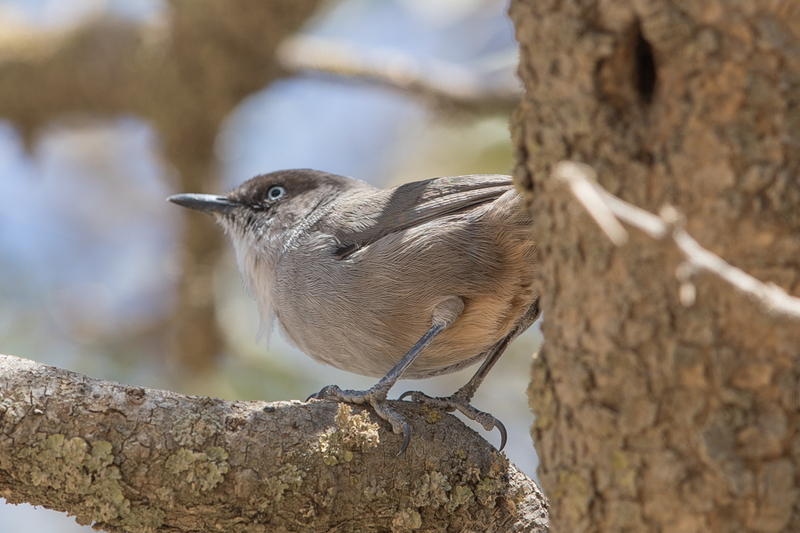 They have a slow song that is quite loud as well as a thrush like warble and are very active, almost always in pairs where they search for insects in the centre of thick acacias, frequently hanging upside down. Their flight is weak and low, with an upwards swoop when landing on a branch. 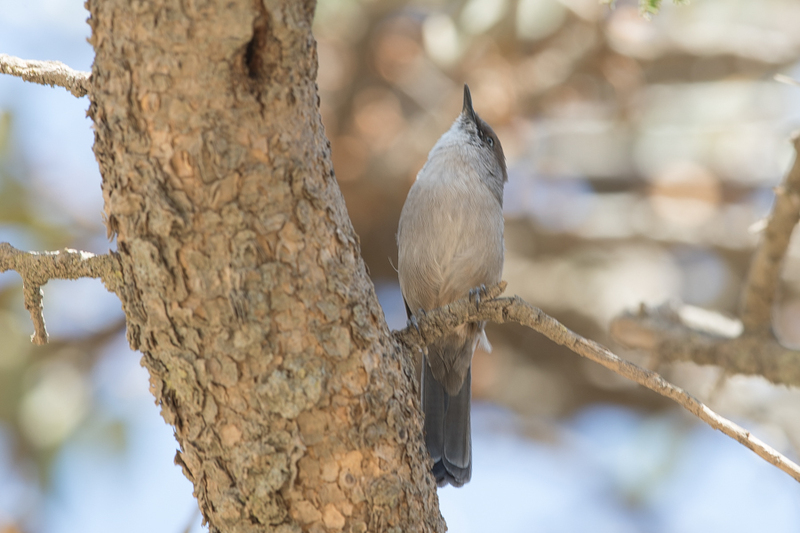 In Saudi Arabia, this species is found mostly within well-developed Juniperus woodland between 1500 & 2900 metres above sea level. They nest in bushes or trees, normally at a low height and breed from March to July. Their diet consists primarily of insects, but fruits will also be taken when available. 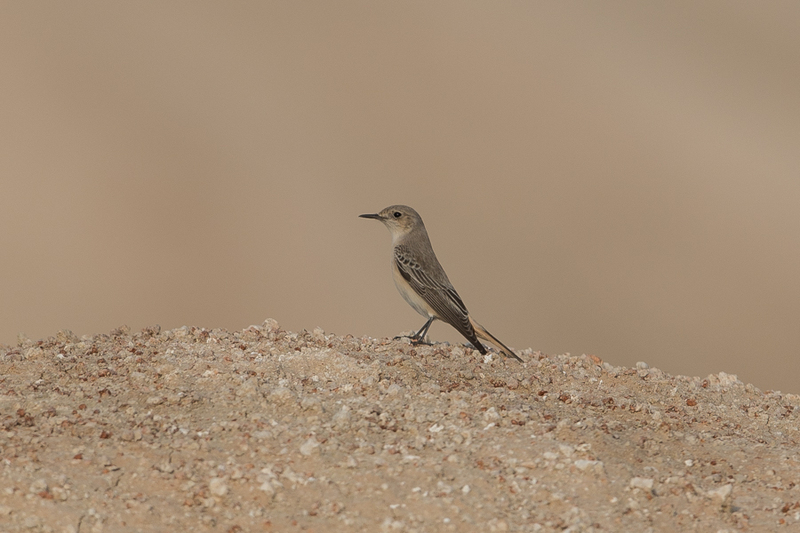 Whilst birding the Jebal Hamrah with Phil Roberts recently we came across a wheatear at the bottom of the escarpment in a largish wadi. 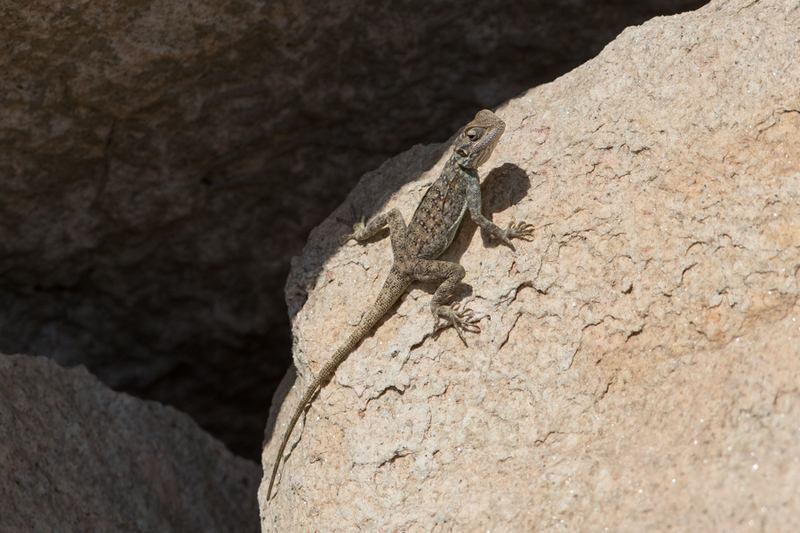 It lwas perched ontop of a large boulder in a slightly vegetated area at the foot of the escarpment. 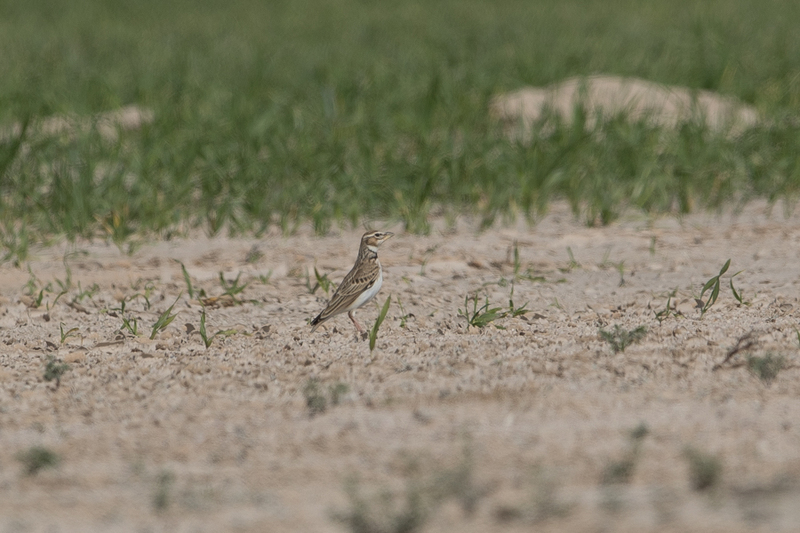 On closer inspection in became obvious it was a female Hooded Wheatear. 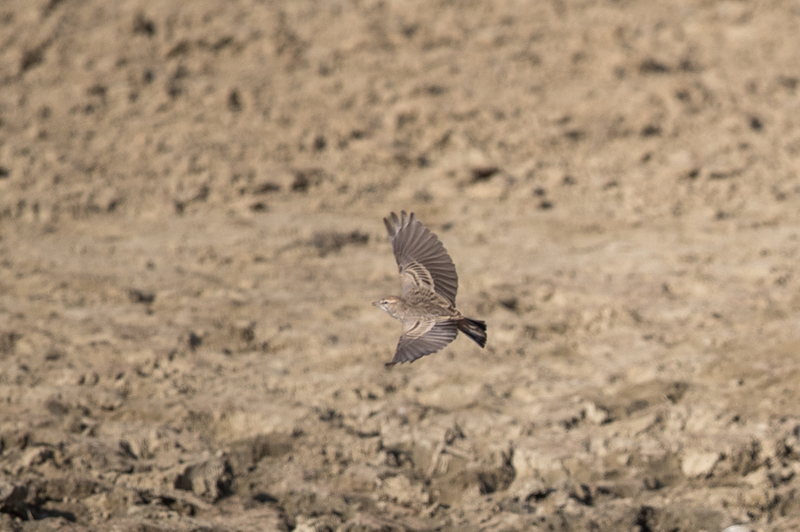 These birds are quite distinct with their large size and long thin bill and the females have reddish tails with restricted black. 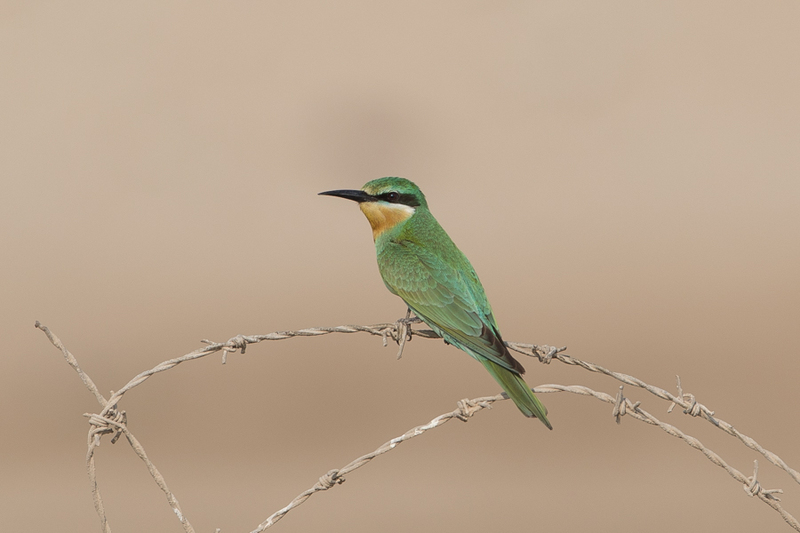 They are a rare or scarce but widespread bird throughout the region and are most often encountered in barren, remote stretches such as those between Buwayb and Towqi in the Riyadh area and the Jebal Hamrah and Shedgum Escarpment areas of the Eastern Province. 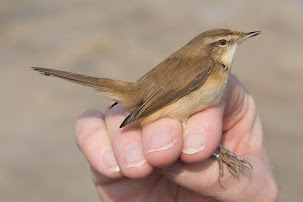 I saw a different female on the other side od the escarpment in March 2018 suggesting the birds may winter in the area although they could still be passage migrants. 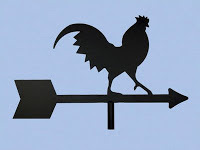 Further visits to the area may show more clearly their status in the region. 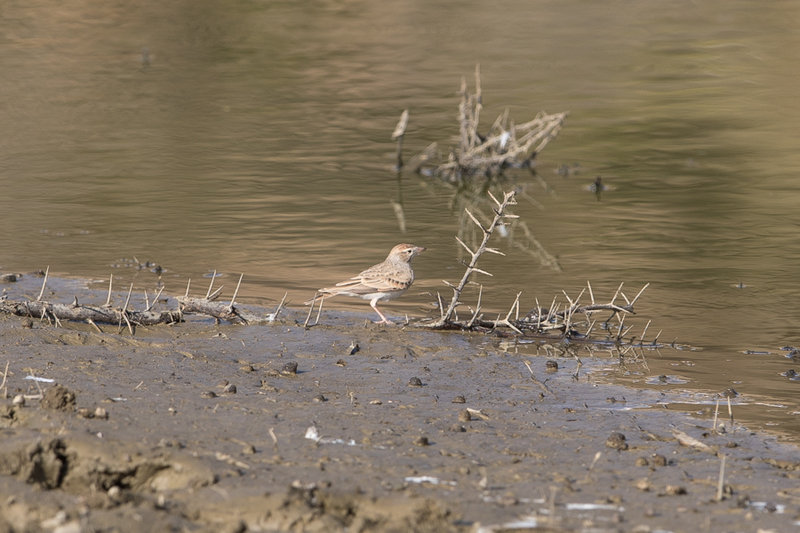 Elsewhere in Saudi Arabia they are a rare but widespread breeding resident of Central Arabia and also occur at Najran, Northern Hejaz. 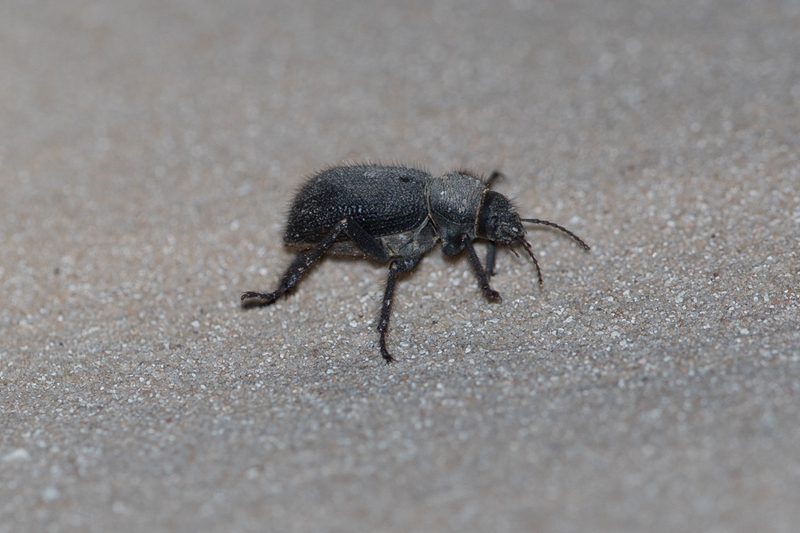 Whilst out looking for owls at night near Juadh we came across a beetle resembling the nocturnal Scarce Stalker Ocnera hispida. This is the first time I have seen this beetle in the Kingdom and the below photo was taken with a high-power flash and 600mm lens. 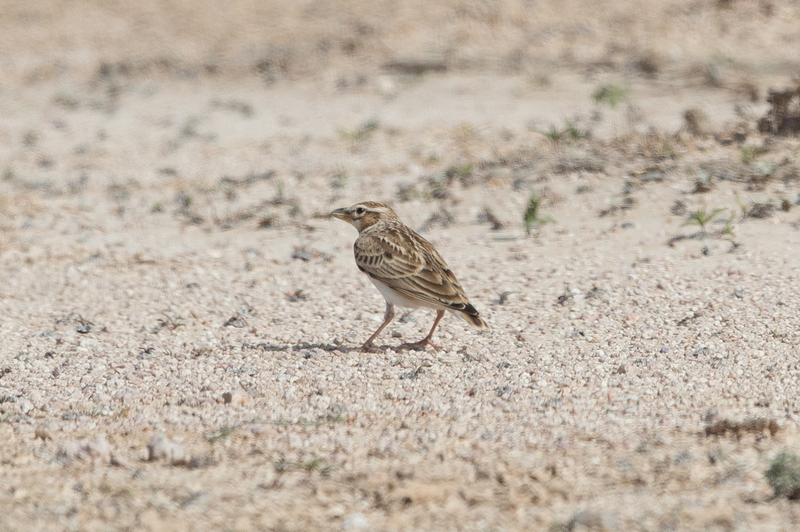 Rufous-capped Lark Calandrella eremica was recently been split from Blandford’s Lark Calandrella blanfordi. The reasons for the split include genetic differences as well as in its smaller size. 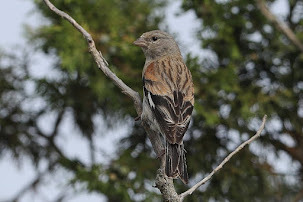 Its lower rump and uppertail-coverts are or only slightly shaded rufous vs strongly rufous. 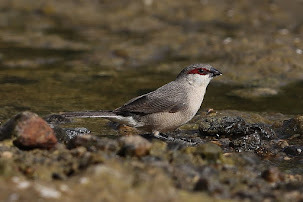 It is much paler above, including the colour of the crown and shade of buff and brown streaking and colour of flight-feathers. 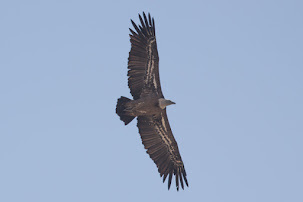 It has greatly reduced dark markings on the underparts (i.e. 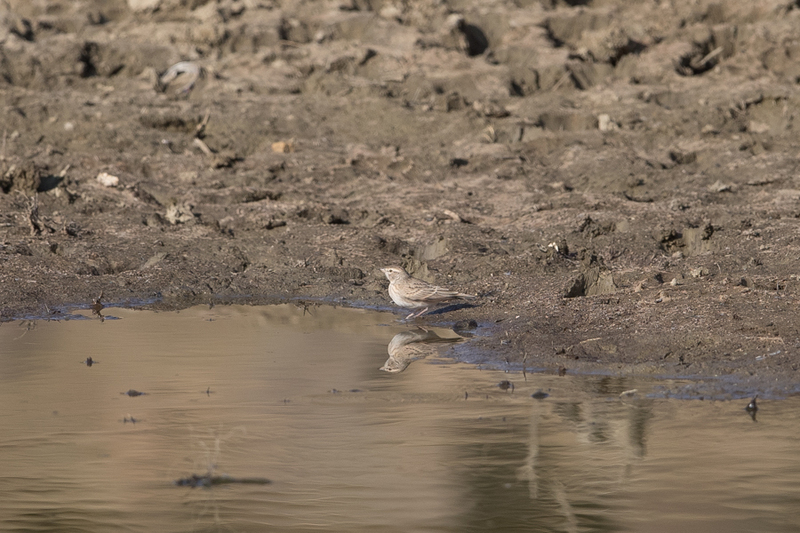 blackish half-collar much less obvious, breast and belly only lightly washed buff vs strongly washed rufous), so white of throat and supercilium are far less striking. The bill is generally much paler. There are two subspecies recognized. 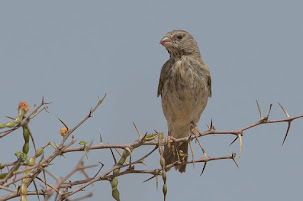 C. e. eremicafrom southwest Saudi Arabia and Yemen and C. e. daaroodensis from northeast Ethiopia and northern Somalia. The Talea’a Valley is near Abha is in the Asir mountains in southwest Saudi Arabia and is a large upland wadi with stony ground and acacia trees growing in the bottom. The valley is hot and dry. We normally arrive at the location at around midday as we have previously been at the nearby Raydah Escarpment but this time we went to the location before first light. We managed to find a very small wet area, the only wet area we saw all weekend. We sat down nearby and waited to see what may come down to drink. 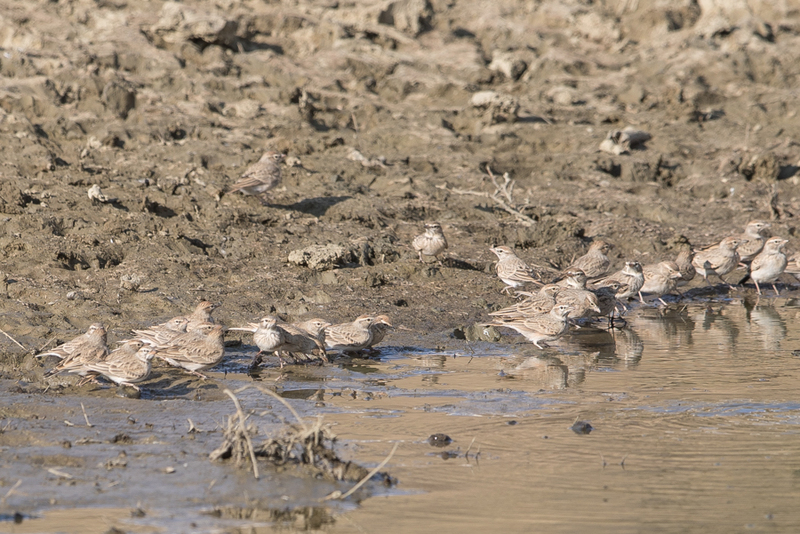 After a short while, a large group of Rufous-capped Lark, containing at least 30 birds, appeared and although at some distance allowed a few photos to be taken. 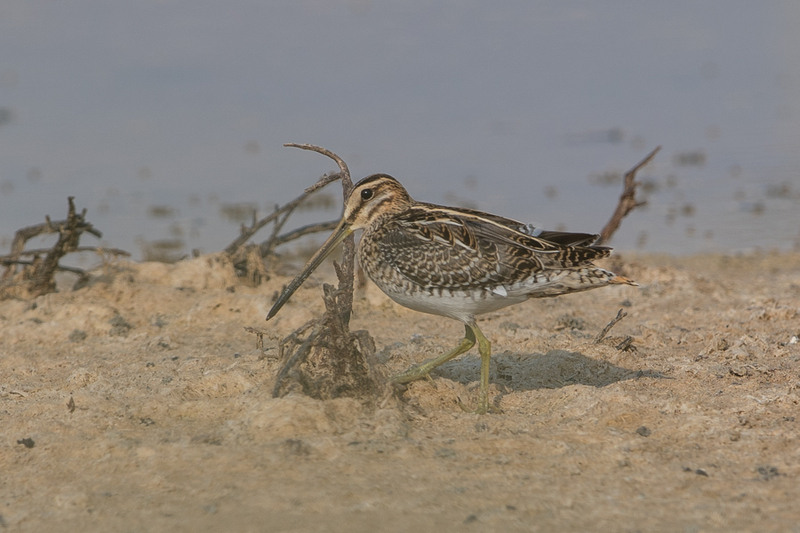 We normally see this species in the summer when they are in full breeding plumage or with juveniles, but mid-October was a period where we had not seen them before and their plumage was much changed from the summer. 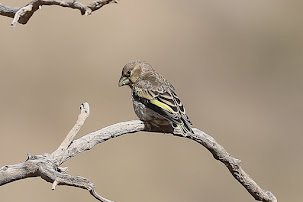 This species is not easy to locate in the Kingdom and a lot of hard work and searching is required to find birds but they are certainly worth the effort.